Michaelangelo took 2 years to sculpt the statue of David. Leonardo da Vinci spent 4 years painting the Mona Lisa. Mozart could write an entire opera in less than 6 weeks! Yet these works of art don’t hold a candle to one sculpted by the forces of wind and water, and lots and lots of time: The Wave. One look at The Wave, a small section of the Coyote Buttes North Special Management Area in the Paria Canyon/Vermillion Cliffs Wilderness, and you might think you’re on another planet. The rippling symmetry of line, the myriad variations of earth tones of brown, beige, yellow, pink and maroon, and the quizzical, gravity-defying rock formations surrounding it surely cannot be of this world! And yet, they are, straddling the border of Northern Arizona and Southern Utah. "The Journey Rivals the Destination"
So, what is The Wave and how did it get here? The Wave is a real-life “Jurassic World.” This unique cluster of U-shaped troughs began as sand dunes, which eventually compacted and solidified into sandstone over 200 million years ago. The troughs were then carved into Navajo sandstone by intermittent streams and floods, whose run-off deposited minerals such as calcium, manganese and iron oxide, while simultaneously eroding the rock along its joints, gradually molding them into their gently rounded appearance. The process of water erosion eventually tapered off, allowing wind and blowing sand to do the bulk of the work in sculpting The Wave into its present form, exposing large deposits of cross-bedded sandstone marked by rhythmic and cyclic alternating grainflow and undulating laminae (a thin layer, plate, or scale of sedimentary rock, organic tissue, or other material). 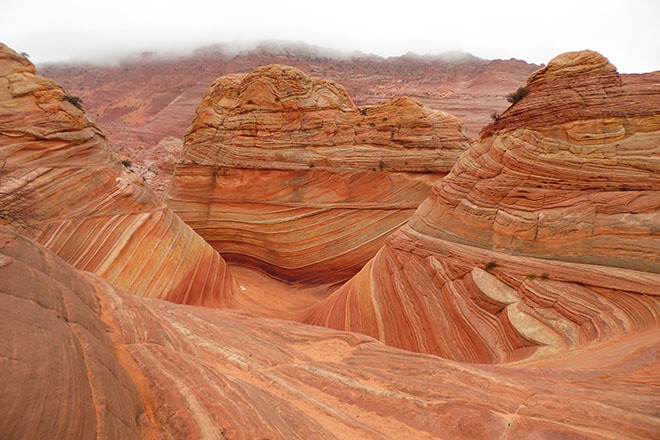 In some areas, the Wave exposes deformed laminae within the Navajo Sandstone. These laminae were deformed prior to the timeframe when sand turned into to stone, which is indicative of the trampling, churning and digestive processes of dinosaurs!